Einstein vs Mann or Hansen? No contest. You can say that again! Climatologists are no Einsteins [very funny – Ed]. But it wasn’t me that said it, it was a successor of Einstein himself at Princeton University, Freeman Dyson. Even putting ‘climatologists’ in the same breath as Einstein is like putting One Direction in the same breath as J S Bach. Unlike the majority of alarmist climate activists posing as ‘scientists’ today, Einstein was a proper scientist. Can’t remember hearing of him deleting his correspondence or not sharing his data, or worse, fudging it in order to fit a pre-conceived politically-motivated conclusion. He also wasn’t paid more because the Aether didn’t exist, his revolutionary concept of spacetime provided the missing structure. 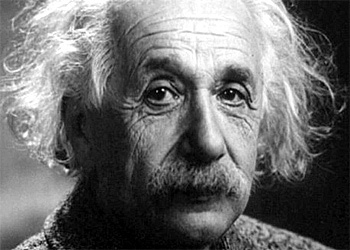 As well as Einstein’s scientific integrity, world governments were not spending trillions of dollars to prove the existence of the Aether – and then tax it. If the evidence did not fit the hypothesis, then the hypothesis must be wrong. No point in trying to shoehorn the data into a flawed theory. I know why: They’re lazy. Instead of digging into the details, most journalists are content to repeat that mantra about “consensus” among climate scientists. When you hear an eminent physicist speak such common sense, it’s like a breath of fresh air amid the fetid stench of climate science. Climatology can hardly be scientific when meteorology itself is more art than science. Granted, meteorologists can usually predict several days weather in advance but climatologists struggle with predicting more over an extended period! “I hope that guy never gets to hear Dyson’s most heretical assertion: Atmospheric CO-2 may actually be improving the environment.” David Bellamy had the courage to say that on his BBC nature programme years ago – David Attenborough then ensured that Bellamy became a non-person. However, recently, Bellamy was called to Buck House by the Duke of Edinburgh to give a presentation. A clip round the ear to the Plant Whisperer that any good parent would be proud of. That CO-2 improves the environment is not such an heretical assertion. This is included in William Nordhaus’s DICE model that Lomberg uses. With other positive factors, climate change only has a net negative impact post 2070. The net negative impact is only if you get a more than 2-3 degrees of warming and the climatologists have been right about the adverse consequences, such as stronger hurricanes, decreasing crop yields, failing monsoons, accelerating sea level rise etc.